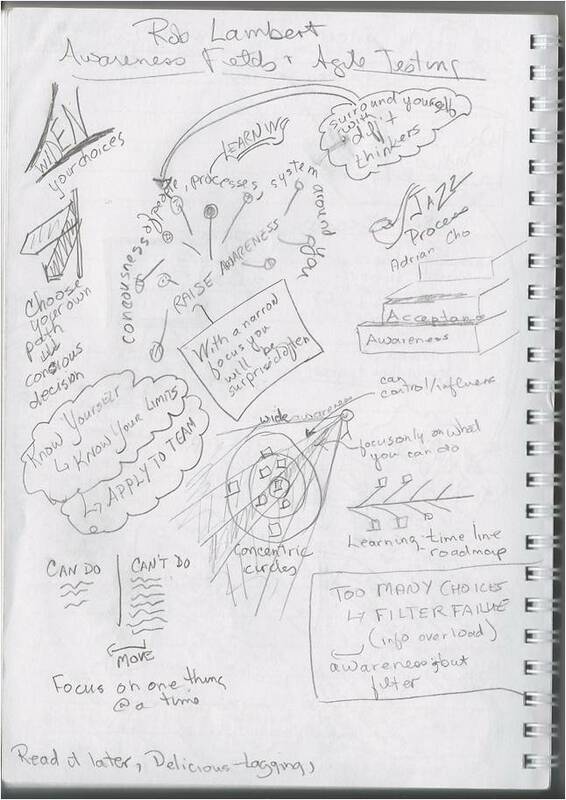 Graphic Recording of Awareness Session at Agile Testing Days | DragonFire Inc. I attended Rob Lambert’s session “Do agile teams have wider awareness fields” at Agile Testing Days in Potsdam, Germany in November this year. The ‘doodle’ I have included in this blog is from that session. I learned about this medium from ImageThink who recorded all the keynotes at the Oredev conference in Malmo Sweden, and gave a session on how to do it. I don’t hope to compare my scribbles to theirs, but I did find it an interesting practice. My test was to leave my book alone for 2 weeks and then go back and see what I could understand. Here’s my takeaways from Rob’s session. To broaden one’s awareness, we need to widen our choices, and surround ourselves with different types of thinkers. Too often, we concentrate or focus on an idea too narrowly and then are constantly surprised by the outcome. Rob suggested creating a learning time line – what do you want to learn, and then set yourself some ideas about how to get there. That way you can slowly move items from the “Can’t Do” list to the “Can Do” list. The first step is awareness. Only when you can see choices, can you begin to accept. Start with yourself, and then start raising awareness to the team, and so on. In my classes, I talk about scope of control, and Rob pointed out when you think about concentric circles in your scope of control, you see that when you widen your awareness, you can widen your influence. Of course, there can be a downside of too much awareness – information overload. I think I need to keep practicing with this medium, but I found I remembered most of it. If you follow the Rob’s link, you can find the slides there. These look fantastic. We are so happy to hear that the workshop was affective for you! Thank you for the kind mention in the post.